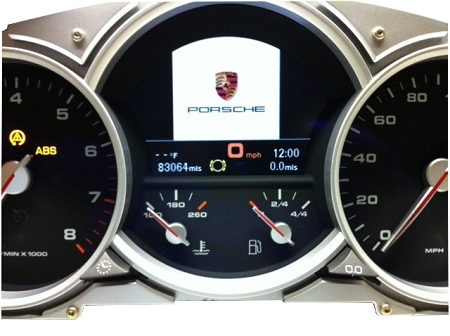 Repair service for your VW Touareg, Porsche Cayenne Turbo or Bentley Continental Instrument Cluster. The repair resolves a common issue with dim/dimming or completely dark center LCD driver information panel. This issue is caused by failed or failing high voltage transformer responsible for powering the TFT LCD panel. The transformer and related components (MOSFET transistor/s and capacitor) are replaced with new/improved OEM parts in order to restore full functionality of your instrument cluster LCD panel. There are rare instances where the failure is related to the actual LCD panel assembly and its ribbon. This typically results in flickering/distorted or white images being displayed on the center LCD. This service requires your instrument cluster to be removed from the vehicle and shipped for repair. Please be advised that this repair will not change or tamper with the current odometer reading or immobilizer settings in your instrument cluster. You will receive the same cluster you shipped in for repair. 24-48hr service guaranteed. Expedited/Express shipping available. Please contact us for more information regarding this repair.